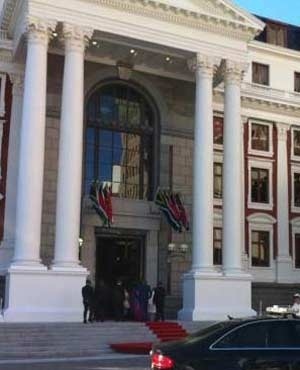 Cape Town – Moving South Africa’s parliament from Cape Town to Pretoria would cost R7bn, but will bring a savings of around R500m to R750m a year. That is according to Congress of SA Trade Unions (Cosatu) and Nomura economist Peter Attard Montalto, who were reacting to President Jacob Zuma’s announcement that Parliament must consider this move to cut government spending. Questioning the move, Cosatu said it was concerned for the future of its members in Cape Town, Montalto said it would cost too much to build a new parliament and City of Cape Town mayor Patricia de Lille said Zuma should start cutting his cabinet before anything else. Zuma said in his State of the Nation address on Thursday that a “big expenditure item that we would like to persuade Parliament to consider is the maintenance of two capitals, Pretoria as the administrative one and Cape Town as the legislative capital”. “We believe that the matter requires the attention of Parliament soon,” he said. Zuma is under pressure to cut expenditure and reform policy and conditions to ignite much needed growth in the economy. Cosatu reacted on Friday, saying the proposed relocation of Parliament might sound good in principle, “but it cannot simply be based upon saving ministerial costs”. “Moving Parliament would mean uprooting 1 400 parliamentary staff and their families from their homes,” the union federation said in a statement. “The estimated cost of moving Parliament is R7bn and we don’t know where such money would come from. Montalto said the proposal has been considered since 1994, but has never happened. “It would save around R500m to R750m per year, but that would be offset by the likely massive cost of building a new parliament in Pretoria,” he said. “It would also take five to 10 years likely for net savings to be achieved,” he said. De Lille said the issue is not one of whether Parliament moves to Pretoria to cut government wastage. “The key issue is that government is too big,” she said. “National Government needs to cut the cabinet, streamline and rationalise Parliament in order to save costs to the taxpayer, and work more efficiently. “However, regardless of whether Parliament moves to Pretoria or not, we will always be happy to welcome the people of Gauteng and the rest of the country to Cape Town,” she said. The move to Pretoria could have a negative effect on the Cape Town economy, Janine Myburgh, president of the Cape Chamber of Commerce and Industry, said in a statement on Friday. “This has been a concern to local business for many years, but I hope we have reached a stage where the growth in the local economy and particularly tourism will enable us to take the blow," she said.